Bookmark this! Get inspiration from some of the best infographics online and take the best elements fro each to create your own. Going visual is one of the keys to successful content marketing. People need fast information, and no other form of content can deliver information faster as an image, video or infographic. Infographics, in particular, are known to be the most engaging content types in social media being shared three times more than any other form of content. Additionally, a high-quality infographic is 30 times more likely to be read than content made with pure text. However, it is not a "magic ingredient" that will automatically make your marketing wishes come true. You also need a strategy for promotion and a compelling content idea to maximize engagement. Lexington Insurance, for example, harnessed the power of infographics with the right practices to boost social engagement by up to 53 percent. Creativity is also important in creating compelling and captivating infographics that can bring in a ton of traffic. Over time, usage patterns emerge as marketers identify the best infographic types that maximize engagement. Also, what better way to highlight the best infographic types than to use another infographic? Infographics are highly useful in explaining processes. In "The Matt Cutts Debunking Flowchart" from Search Engine Land, they highlighted the key (humorous) questions in the process of exposing crazy notions online. A comparison can be used in different scales. Some compare two or more products, but MoveHub.com’s infographic compares the cost of living all around the world. Using timelines is a great way to look at key events in the histories of popular products. By incorporating interactivity, you can enable your audience to focus on specific events and provide a more meaningful experience. The Evolution of the Web does exactly that. Roundup infographics are great for summarizing collections. This infographic on Oscar dresses worn by winners is a great and creative example of this. Bafton’s “Graphic Ingredients” infographic utilizes a sandwich to represent the components of their brand. This one deserves credit for the creativity in using a sumptuous-looking sandwich. One of the best ways to maximize the value of your content is to provide practical and actionable steps. One example is Best Infographics’s “How to Tap a Watermelon”. The infographic itself may be simple, but it does provide the specific steps and necessary materials needed to do the job. To improve the communication of statistical data, you can organize information using a chart or table. The Guardian’s infographic on gay rights in the US is a good example of this. Notice how they also incorporated interactivity to make the content more compelling. Infographics can be used to categorize just about anything – from products to animals. 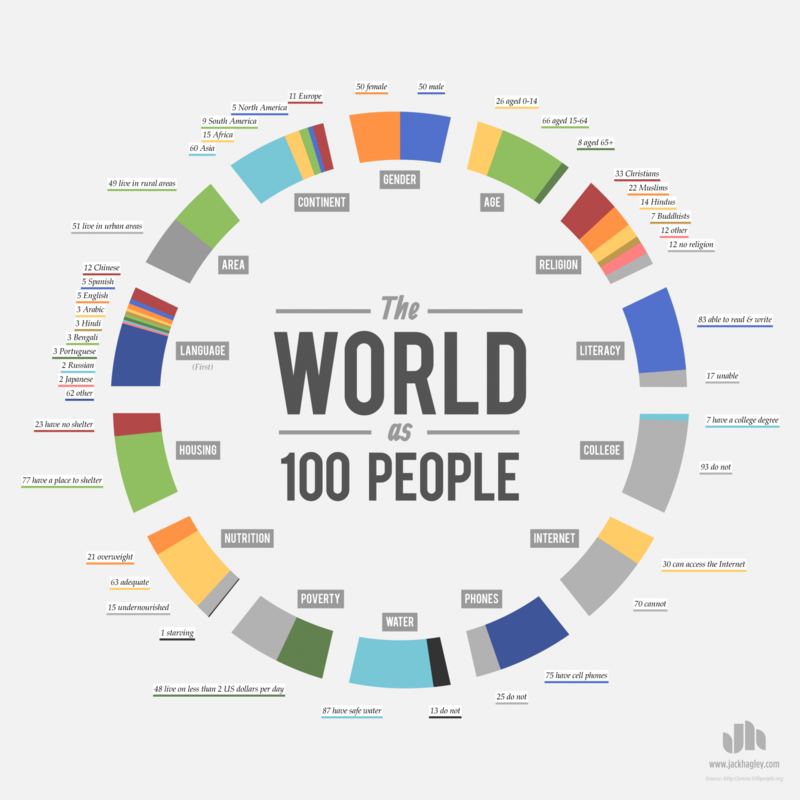 In The World as 100 People, specific categories such as religion and language are used to classify a sample population. A “universe” can mean different things. In “Fantastical Fictive Beers”, it means the collection of all beer brands in fictional worlds. Images can be used to increase the sense of urgency in warnings. This particular infographic does this clearly well with images that represent the struggles of employees on the verge of resignation. The social community loves metaphors and quotes to go with visual content. A great example is LinkedIn’s infographic on lead nurturing. This time, let’s look at a tool that makes infographics. If you want to build an online portfolio, then you should consider using Visualize.me’s infographic resume creator. Professionals and businesses commonly use infographics to create visual and detailed reports. This example from Information is Beautiful reports the income of musicians in various digital channels. Infographics are powerful tools to visually represent your company’s products. Even giants like Google use them to help explain how their search service works. A keen observer can see the world in trends, but some require a more visual message. This interactive infographic from The New York Times is a great example that shows the trend of college attendees about their parents' income. Apart from timelines, infographics can be used to provide a glance at the history of any industry or subject matter. This interactive infographic from Histography.io, however, covers everything in Wikipedia, that is. Infographics on places and events can be about anything. In this infographic's case, it is about the most mentioned NFL players in SportsCenter. The flexibility of infographics can be used to create just about any guide. PersonalCreations.com’s “Herb & Food Pairing Guide” is a prime example of how visual content can make any information more fun to look at. Infographics offer a creative way to show your family tree. However, family trees can be used on product lines, franchises, and other relationship networks. Take a look at DailyInfographic.com’s Hollywood Family Tree for example. This particular infographic sheds light on the effects of modern media consumption, particularly on women. It utilizes visual content's power of capturing attention to increasing awareness and deliver something meaningful. Reading biographies can be somewhat boring, but not with infographics. Funders and Founders’ infographic did a magnificent job in highlighting the ups and downs of Steve Jobs’ life. Emotion-inducing stories matched with a brilliant visual representation result in a truly powerful experience. This is what Bloomberg’s “What’s Warming the World” infographic manages to accomplish. Charlie Chaplin’s “Love Yourself” manifesto is a truly moving piece. Credits also go to Mindvalley Academy for doing a good job in highlighting the manifesto’s key takeaways. Acronyms are effective devices for improving memorization. If you want to make a lasting impression to your audience, then using an acronym infographic is a great way to go. Check out this example from Steamfeed on social media acronyms. Infographics are highly effective in organizing data, and they can be used for just about any list. For example, FlowingData.com created this infographic on the most common uses of time. Great infographics start with a big idea. With the infographics above, you should be able to have a visualization of the infographic you want to use. Just remember that it also takes research and promotion strategies to make the most out of your infographics. Good luck. Christopher Jan Benitez is a professional content marketer and writer. He has helped small businesses achieve their goals by implementing a strong content strategy that emphasizes their unique selling points and promoting created content using effective online channels and methods, in particular social media marketing and search engine optimization techniques.